The Warriors of Legend, is an adaption of the anime, The Heroic Legend of Arslan, itself an adaptation of a novel series of the same name, penned by Yoshiki Tanaka. It’s important to bear in mind I have neither watched the anime, nor read the novels, in fact I didn’t know the series existed until I picked up this game. Arslan is the young, idealistic prince of Pars, a distinctly Persian realm steeped in history and enriched by a strong sense of cultural identity, which includes the keeping of slaves, or ‘Gholams’. The story begins with Pars being invaded by the European Catholic stand-in, Lusitania, a kingdom driven by their fervent belief of one god; Yaldaboath. 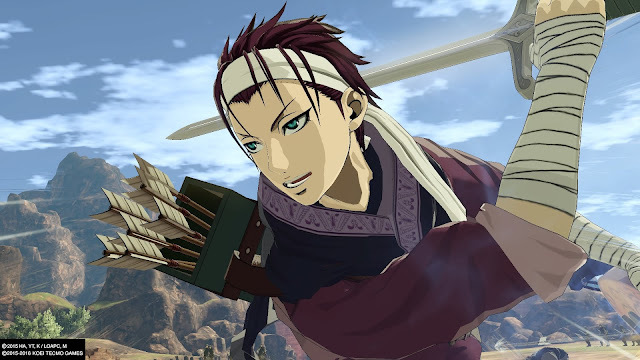 In my experience – which is by no means all encompassing – licensed games of movie and anime properties tend feel shoehorned, with video clips forced between missions in the most uneven and ill-suited manner, both doing a disservice to the source material and detracting from the quality of the game. Take last year’s Shingeki No Kyojin: Humanity in Chains (Attack On Titan) for example; I was one of the few I encountered who genuinely enjoyed combat, but the story mode was a hack job of the anime’s action scenes, utterly devoid of context and plot. You would win missions and achieve objectives, only to in fact ‘lose’ in the following video clip; there was crippling rift between what you did and what you were being told you did. Arslan: The Warriors of Legend is very much not that, it goes to great steps in its mission design and visual style to integrate elements of the anime, with the core Warriors combat and succeeds in creating an experience quite able to stand on its own. 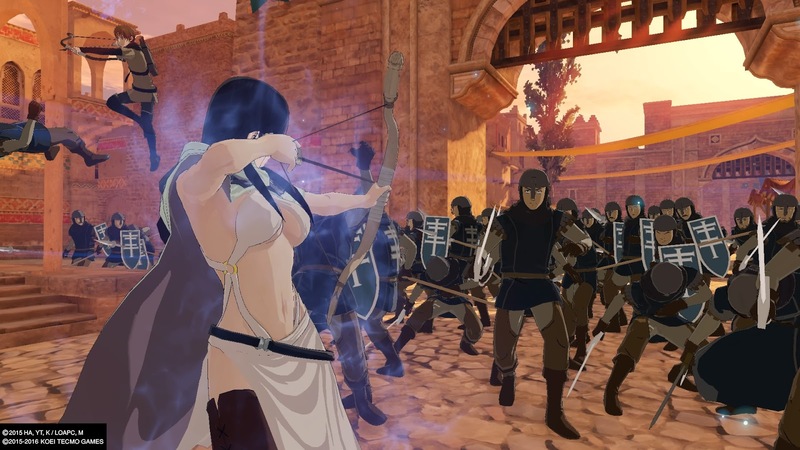 To me it doesn’t feel like a ‘best moments’ compilation, or raw fan service, but rather a Warriors game set in a new and exotic world, brought to life by the best storytelling I’ve encountered in the Warriors series to date. It’s complete and coherent, to the point where if you had told me it was simply an original property thought up by Koei Tecmo, I would have believed you. Whether or not it truly does justice to the anime, its pace, or the representation of its characters, I naturally can’t say; but I was not left wanting. 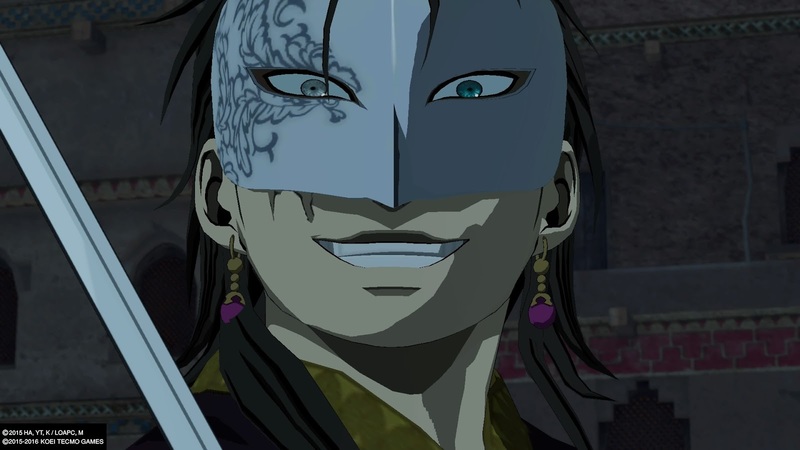 Arslan: The Warriors of Legend uses the visuals of the anime between missions, in what I believe are recut vignettes, more like a visual novel in their presentation, rather than actual video clips. This creates a more cohesive feel between the two elements, typified by the wonderfully smooth transitioning into and out of combat; Arslan’s 2D face fades perfectly into its 3D incarnation and the mission begins, loads are hidden behind the story sequences. This only works so well because of the excellent art style, which uses cel shading to capture the look of the anime – there’s a good chance that a more descriptive term exists to describe that graphical style that I’m just not familiar with. 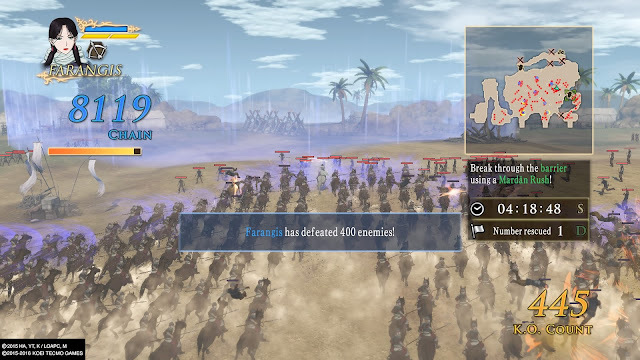 Menus are avoided wherever possible; there are no pre-mission briefings and when you first boot up the game you’ll be dropped straight into Arslan’s maiden battle. That’s a testament to the game’s heavy focus on storytelling. Surprisingly the game features the voice talent of the anime and as such, dialog is solely in Japanese with English subtitles, a definite plus considering Koei’s dark history of English voice acting. However, due to the sheer volume of important in-mission dialog, I spent a disproportionate amount of time reading subtitles and rather reflexively bashing out combos – a good job then that the Warriors combat remains trivially easy on the lower difficulty settings. The combat has lost some of what makes it appealing due to the relative uniformity of the enemy officers; unnamed captains and generals have their place, but Warriors games thrive on huge rosters of colourful characters with diverse move sets. 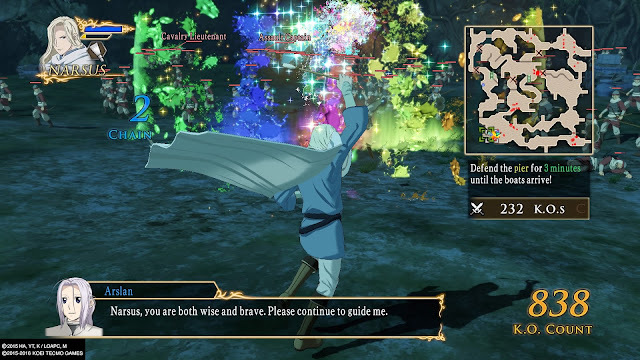 However, while the combat may suffer, particularly early on, the game is ultimately bettered by its restraint and adherence to the narrative; characters on either side of the conflict benefit greatly from the additional focus and breathing space, that same attention simply would not be possible were the cast significantly expanded. Prince Arslan himself is primarily a swordfighter, though he like many of the characters unlocks additional weapon sets to switch between in combat. Befitting the Persian inspiration and I suspect the source material, there is a much greater ratio of bow-armed fighters; those of the core cast feel suitably distinct. The dashing rogue Gieve can switch between a Lute and sword combo, and a bow, while the lithe lady Farangis uses just a bow, though to murderous effect; both move sets are quite different to that of nimble Elam. Narsus does vibrant battle with paintbrush, pulling out his easel for special (musou) attacks; he is also the focus of much of the game’s humour – a welcome by-product of its anime roots no doubt. The action is pretty basic in that while there are systems built atop the core Warriors hack n’ slash combat, none are particularly complex. Some enemy officers use shields that must be periodically broken to inflict damage, allowing them an opening to counter attack. It’s a welcome system that elongates and alters the flow of encounters, adding much needed weight to several key fights. In specific spots of most missions, Mardan Rushes can be initiated. These summon a brief and destructive formation of soldiers on to the battlefield; cavalry, infants, or archers. Aside from cleansing the immediate area of enemies, rushes are necessary to smash through barricades, break open enemy shield walls, and set alight traps or defences. However, it’s not a deep or remotely tactical system, despite originating from the Bladestorm games. While they may be difficult to coerce through spots of tight terrain, the charging ranks Parsian soldiers usually look pretty cool. 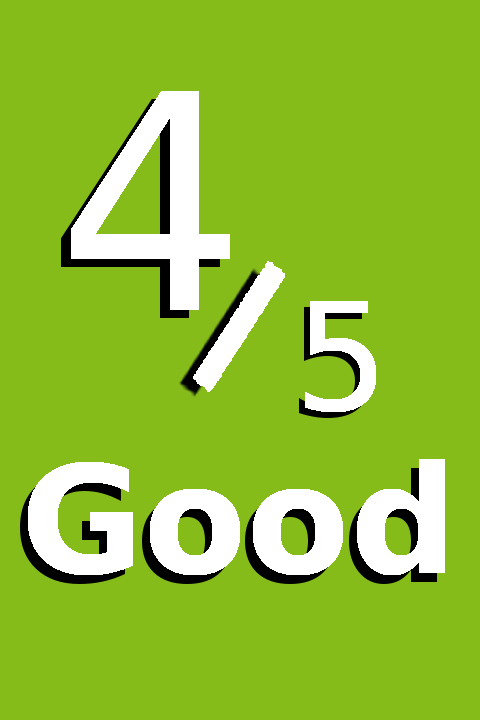 Items with passive abilities have been replaced with cards; each has a point value limiting which can be equipped at a given character level, only three can be equipped at any time. You acquire duplicates, which can be synthesised to create potentially stronger cards. These are collected on the battlefield as drops from defeated enemy officers. Rarer are the recipe books that can be used to grant more basic pre-mission buffs, though these can only be used in Free Mode. Both the cards and recipes are largely superfluous on the normal or lower difficulties, and therefore added very little to my experience. I spent most time with the story mode; it’s pleasingly meaty, despite some real short missions. Naturally, all can be replayed in Free Mode as any unlocked character, of which there are fifteen. Additionally, I gained access to around a dozen bonus scenarios, judging by the way they are categorised I expect there are a good deal more. The game can be played co-operatively online and locally. Arslan: The Warriors of Legend is a fun vehicle for the intriguing story of Arslan, a well realised tale of political and strategic manoeuvres, and crazy fights – though the later may well be due to the Warriors influence. The game deftly stiches the hack n’ slash Warriors action and anime-adapted story sequences together to create a cohesive experience, a great deal of which must be attributed to the stylish visuals and voice talent. The combat is notably less intense than other modern Warriors games and there are few truly large battles. The limited pool of named adversaries reduces the action to even a more simple form; though equally, it permits you to pay greater attention to the in-mission storytelling and character development. The shield and Mardan Rush systems help the gameplay a little, but conveyance of the narrative is clearly the game’s focus, to its advantage I believe.